I am standing under the light of the full moon near the apple tree in the backyard of my home. Suddenly the light of the moonbeam begins to lift me up, off the ground, towards the moon. I awake, frightened, my heart beating fast. I have never forgotten this childhood dream. As a young girl, I did not yet know that I had a lunar legacy in my cultural history. In years to come, I came to understand the power of the cycle of the moon: the potency reflected in its darkness and the manifestation of that potential energy in its fullness fourteen days later. More recently, in my dissertation research, I learned that I have an ancestral lunar legacy. In the mountainous villages of northern Italy, my antecedents knew how to grow, gather, and preserve food, along with numerous other activities, in harmony with the cycle of the moon. These rhythmic practices were known and practiced until recent times, and are still honored by some villagers. A famous folk story of that area called “The Pale Mountains” tells of a Princess of the Moon who marries a Prince on Earth. Small wild men, known as Salvani, who live in the crevices of the Dolomite Mountains spin the moonlight and drape it over the mountains so that the Moon Princess can live on Earth and be reminded of her lunar home. 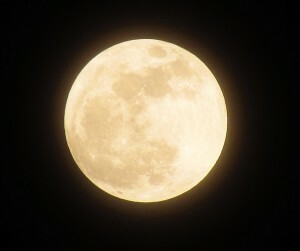 I have also come to appreciate my own reflective lunar nature, at home under the night sky. I accept and embrace the gifts of my lunar radiance, which differs from that of my sunny friends. I claim my own bioluminescence. Now I understand this childhood dream as an early calling, the kind of awareness that can happen in our dreaming life. It seems like the moon was alerting me to a future wisdom, asking me to remember my lunar legacy. Moonbeams still exert their influence in my waking life. No longer wary of involuntary levitation, I consciously bask in the moon’s light, gaze into her round radiance and ask for wisdom. I imagine the moonlight imparting a kind of lunar vision that will enable me to see what may not be evident. Shining through the window in my bedroom, the light of the full moon often awakens me from sleep. Is it a playful invitation to come dance in the light, as did the magical women in the folk stories of my ancestral lands? Or a wakeup call to remember our lunar consciousness and the cyclic harmony available to us all? This entry was posted in Dreaming, Italy, Moon and tagged dream, Italy, lunar, moon, spirituality, Trentino by Mary Beth Moser. Bookmark the permalink. Beautiful~ and lovely follow-up to the recent lunar eclipse!